One of the great wonders of life is watching the leaves change colors in the fall. 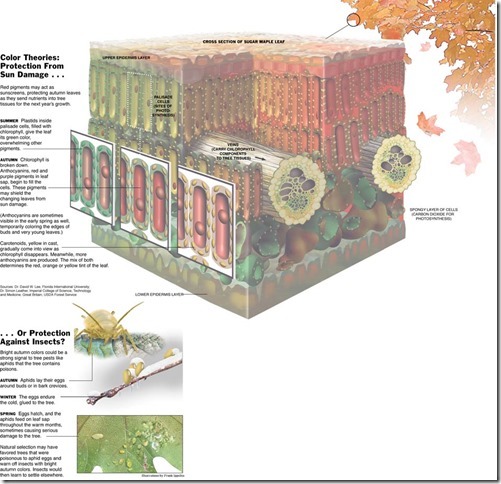 When temperatures get cool, chlorophyll begins to break down revealing the underlying pigments in the plants’ sap. This depiction of the inner-workings of a maple leaf shows the process in action (see the annotated version that appeared in The New York Times for more detail). Science illustrator Frank Ippolito is behind this beautiful illustration and a series of other “cube” drawings – drawings cleverly constructed to illustrate multiple dimensions in a scene. The first cube drawing he developed appeared in a lead story in the New York Times Science Times and was the basis for a series of postersshowing various ecosystems teeming with life: a tide pool, a deciduous forest, a desert, a rainforest. This maple leaf cube was originally commissioned by The New York Times to accompany the lead story in the Science Times titled “Those Brilliant Fall Outfits May Be Saving Trees,” by Carl Zimmer. Ippolito’s portfolio at Production Post Studios contains his cube series, Life Underfoot, as well as other work. You can also find his work on science-art.com.